The picture above is a Crannog on Loch Tay. In the summer, by the way. It’s probably not this nice in November. Actually, I know it isn't. 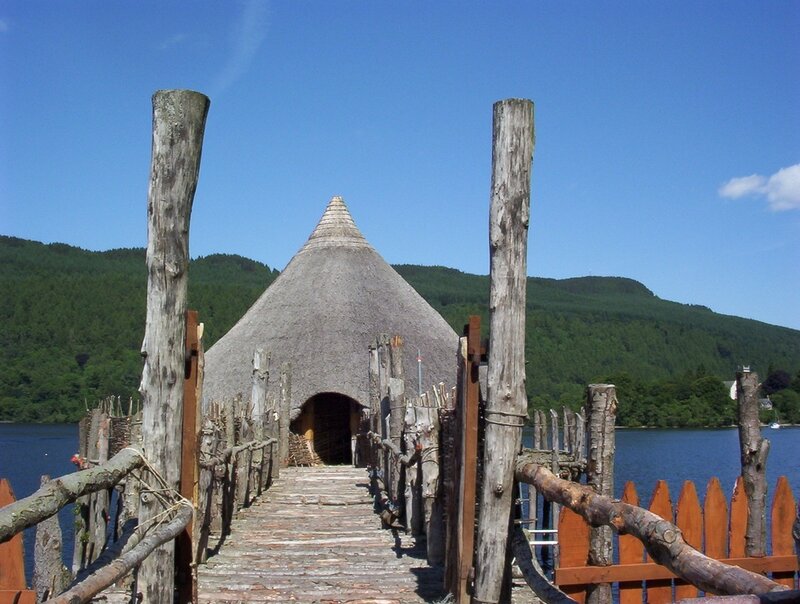 Anyway, I’d always assumed a Crannog was some kind of hedge-dwelling mammal, a bit like a hedgehog, but it turned out to be a hut on stilts in a lake… how about that? Edradour is Scotland’s smallest distillery. It was here that I first encountered cask-strength whisky. We met this individual at a deer park in 2007. We chose to walk around the paths, but – for no extra fee – the park owners would lend you a 4X4. Having crawled up and down some of the trails, I’m glad I didn’t decide to learn offroading on the fly…. Loch Tay, seen from a viewpoint where Queen Victoria had a picnic once. You can drive right around the loch, but it’s quite a long way. From the north shore (the side this photo was taken from) the land rises into some pretty high hill/mountains. Inchmaholme Abbey, home of a very noisy bird that didn’t like us being there. The abbey is on an island in the only lake in Scotland (the rest are Lochs) and reached by boat. An albino Peacock at Scone Palace, 2007. The view north (I think) from the animal park at Comrie, 2009. It was there that we discovered that all Prairie Dogs are named Arthur. The view vaguely eastwards from the garden of the cottage in Perthshire where we've stayed on several occasions.